Kobo has issued a new software update for their line of ebook readers that adds a couple of new features, most notably a fast page flip feature to quickly scan through pages. The new firmware version is 4.8.10956. It’s available for most models except the Kobo Mini. Like usual you can wait for the update to download and install automatically over Wi-Fi, but Kobo generally does a slow rollout so it might take a few weeks for the update to show up. If you want to manually install the update now, the downloads for each model can be found on this Kobo Firmware Downloads page. The main change with the update is the addition of an enhanced page-turn feature that lets you quickly flip through pages. 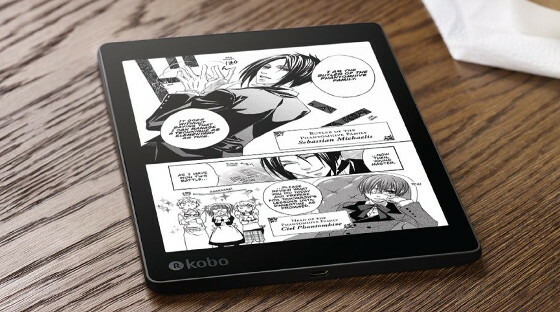 Previously the enhanced page turning feature was only available on the Limited Edition Kobo Aura One. It’s good to see Kobo porting the feature to their other models as well. To activate the new fast page turn feature, hold the bottom corner of the screen—right for forward and left for back. Unfortunately the fast page turn feature only works with Kobo’s KePub format, not regular ePubs, PDFs or any of the other supported formats. But you can easily convert files to .kepub format using Calibre or the Kepubify conversion utility. The release notes also mention a new option in Reading Settings to set page turns to tapping or swiping, or just by swiping only, but this was already in the previous 4.7.10413 firmware. I really like the new fast page turn feature. Now I must convert all my CBZ/CBR files to KEPUB though to use it… ugh. Updated Kobo Touch, Kobo aura and Kobo aura 2. Great firmware update. The older Kobo Touch has seen a drastic improvement on the page turning and battery. Maybe it’s just my perception but my LE with this update has been noticeably faster in just about every way when compared to my original Aura One. Battery life also seems to be improved a little: I was getting 14-16 hours with the original vs 17-18 hours with the LE. It’s worth going out of your way to get it. Yes, this update is faster. The stats are also fixed too along with a whole bunch of other bugs. Also, this update was just released for the new mark7 devices (H2O2v2 and A2v2) which I’ve added to my firmware update page. The difference between the mark7 devices is the processor model. You can tell which version you have based on your serial number. If the 7th digit of it is a 2, you have version 2 of the H2O2 or the Aura ed2. I will need a 7.8 for pdf reading purposes. Is the KA1 still good or better wait for onyx nova? I don’t consider 7.8″ screens large enough for PDFs unless you’re fine with using landscape mode most of the time and only viewing part of the page. The way the page scales in portrait a 7.8″ screen is barely any better than a 6″ screen. If it were me I’d get a 9.7″ or larger model. I just need to read easy PDF 100% text, from books which are already that size in their printed form. Let’s 21cm x 12 cm. For larger books I have a 10 tablet already. I was looking for a middle ground because I can’t carry 2 devices with me everytime. I also would like to avoid using tablet too much cause it causes me eyestrain. But I’m afraid ka1 is a little bit wonky even with koreader. I would need to use the highlighting feature quite a lot. If they’re just basic text-based PDFs you might be able to use reflow and then it wouldn’t matter what size screen you use. An easy way to test would be to install the Kindle app on your tablet, which will give you a unique email address shown in settings that you can send documents and ebooks to. Then send one of your PDFs to that email, making sure to put “convert” in the subject line, and Amazon will convert it and you can see if the layout is acceptable. Kindles offer the best highlighting features and they make it easy to export them so if Amazon’s conversion works well for your PDFs a Kindle might be the best option. This firmware has been pulled by kobo for an unknown reason. You can still download it for all devices except for the kobo7 ones from my firmware downloader (mentioned in the article) by clicking the button “Other Versions” beside each device. You can also show the table at the bottom of the page, which has the links. Sure but the update destroyed a significant part of my library, including anotated PDF documents. Update basically turned my kobo into a brick. It no longer will access any of the books I have on my sd card. I tried a second card think it was the problem still broken. Waiting for them to release update so I can actually use it again. I updated the Kobo Aura One and now I can not download my library ebooks I have borrowed! Very frustrating. It was a breeze before to download an ebook and now nothing. I can get it on my ipad and Mac but not my Kobo as before. Just in a day it has stopped working!!! Not Happy!!! Signed out, signed in. Turned it on and off plugged in. Did Kobo Repair etc. etc. Still no downloaded books!! Please fix this problem!! Breaking features with firmware updates…something Kobo does regularly. It seems like with every update they change something for no apparent reason and break other things that worked perfectly fine before. Why my Kobo don’t downloaded automatically firmware 4.8 ? My Kobo is at least 5 years old, I m not able to load gift cards to buy books. Would an software up grade help, the instructions offered don’t match what I’m seeing on the settings screen.